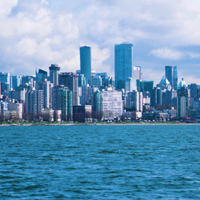 A coastal seaport city at the lower mainland region of British Columbia, Vancouver is the most populous metropolitan in the province. Being consistently named as one of the top most liveable cities in the world, it is home to the most ethnically and linguistically diverse group in Canada. This melting pot of rich diversity has found its unique flavour integrated in its culture, cuisine, and fashion. No wonder that one of the most desirable fashion events of the country, the Vancouver Fashion Week, gets to be hosted twice annually in this marvellous city.